This hotel is located in the cosmopolitan port resort of Hersonissos, at the foot of the mountain, just 300 metres from the sea. 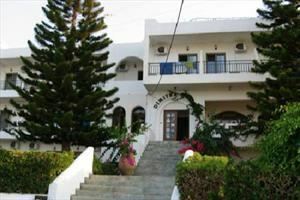 The hotel is situated near the ruins of King Minos' summer palace, at the quiet end of Hersonissos village. The complex is approximately 1 km from a choice of tavernas, supermarkets, local craft and other gift shops as well as bars with dancefloors. 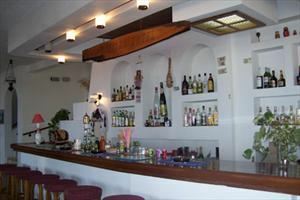 The village's ideal central location and the frequency of the local bus services provide easy access to Hersonissos and Malia's nightlife and to Heraklion's market and attractions as well as to most of the beautiful places on the island. This is an excellent holiday resort and the hotel's location offers guests the chance to enjoy a magnificent view and splendid sunsets. 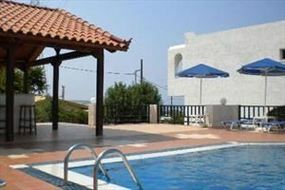 It is just 30 km (19 miles) east of the city of Heraklion and the airport. 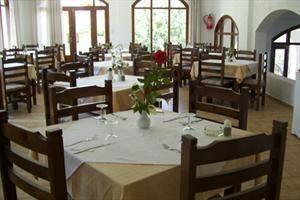 The hotel comprises a total of 23 double and triple rooms. Facilities on offer to guests include a hotel safe, a bar and a restaurant. The rooms come with a telephone and an optional extra bed. 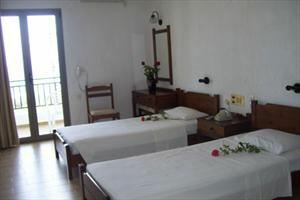 They are located on the ground, 1st and 2nd floors and offer a private balcony and a bathroom with a shower, air conditioning (extra charge), TV (on request) and music. 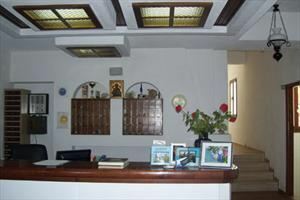 All rooms are regularly serviced (6 times per week). The hotel features an open air swimming pool with a children's section and is near a beautiful, sandy beach, which provides facilities and the chance to enjoy water sports. Guests can enjoy a drink accompanied by soft music around the central bar, in the living room or on the lovely veranda, or have a rest by the swimming pool or sample some of the delicious snacks at the snack bar.